After a good day on Saturday which saw me rise to 26k I fell back down to Earth with a bump on Sunday with my triple Liverpool and Hazard doing less than nothing. Rondon and Maddison gave me some good returns on Saturday whilst Anderson finally got me something. The remainder did pretty much nothing although I finished above the average which gave me a small green arrow so I can’t complain too much. As I am free-hitting in GW32 this will be the team that I go into GW33 with which isn’t too bad given City, Wolves, United etc won’t be playing again. I have already drafted in the two 3.8 defenders (Connolly and Simpson) and a 4.2 midfielder (Romeu) to fill my bench and avoid the rises. I will keep my free-hit team updated throughout the two weeks on Twitter as the team becomes more refined, we get injury news etc. After a small drop overnight on Saturday with me losing the Wolves clean sheet late to a Rashford goal, Mane again bailed me out with another 10 pointer, he has been a great buy. I am in good shape with seven double gameweekers in GW32 after which I will look to maximise the 3-1 and hopefully 4-1 fixtures with my remaining 7 transfers. 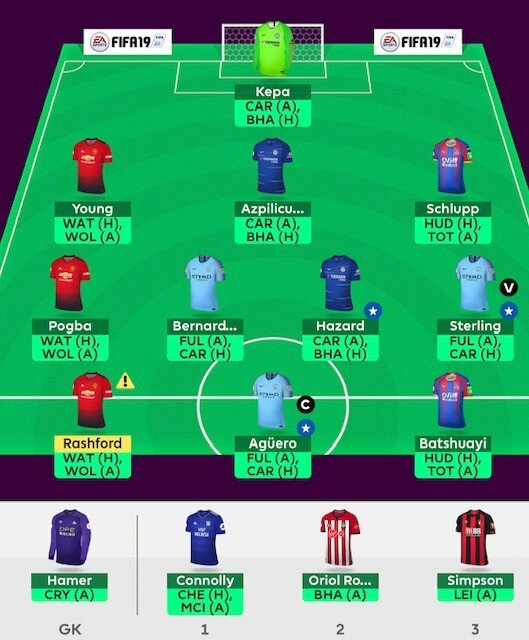 Van Aanholt and Pogba are currently top of my transfers out list (after the double gameweek) whilst I am looking at how to bring in Kane and maybe even another City mid but with 0.1 left in the bank I will have to rethink. Brighton will have three extra league games over most other teams following their FA Cup semi so a potential enabler from there may be profitable. After a decent Saturday with Maddison and Anderson (cap) returning, I had a disappointing Sunday as I didn’t make my planned Anderson to Mane (cap) move due to being low on transfers, and wanting to get Aguero in after the break. It could still pay off as it looks like Aguero will have Fulham and Cardiff next gameweek but I missed the opportunity to move into the top 15 overall which is frustrating. 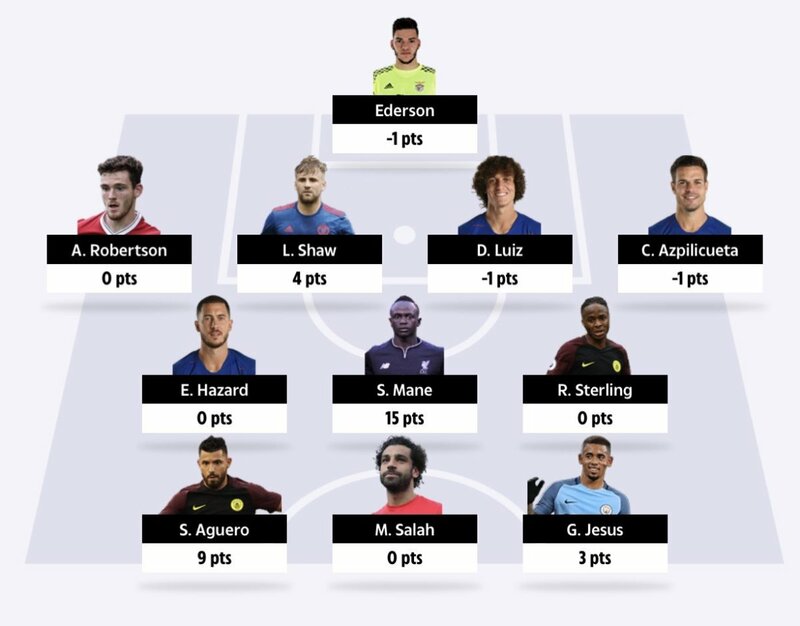 My Liverpool and Chelsea players did nothing on Sunday, aside from a few bonus points. 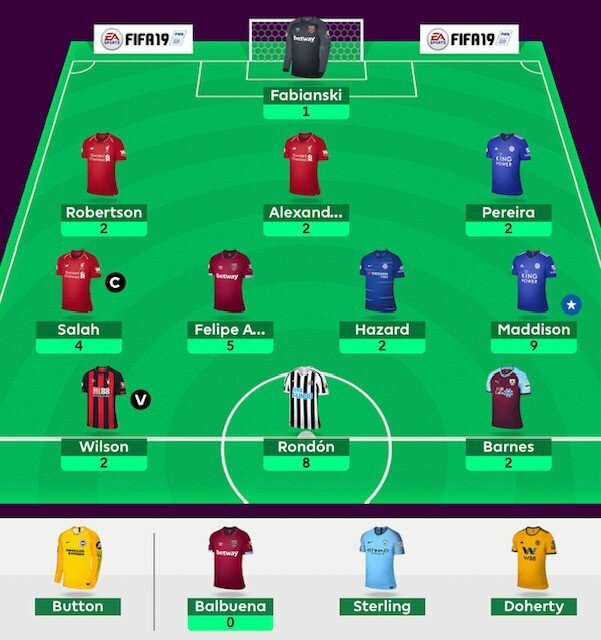 I am working out how to get Aguero in for the plum double gameweek next which means either taking out Hazard, who also has a double and is a good captain option for some single gamedays throughout April, or making a double move for Anderson and maybe downgrading someone like Almiron. We get to see the City line-up which is very useful. This is where my reckless transfer usage throughout January and February will come back to bite me as I am very limited in the moves I can make from now on but who’s to say I would be in the position I am in now had I not been aggressive, some post-season reflecting needed. Another rise due to Mane who has been a great signing in March. My Chelsea defenders let me down again but do have good fixtures (again) in April so I will be holding on. No transfers left for March; I will look at April transfers for next week when the window opens. Not a good week without Mane and a subsequent drop in rank. 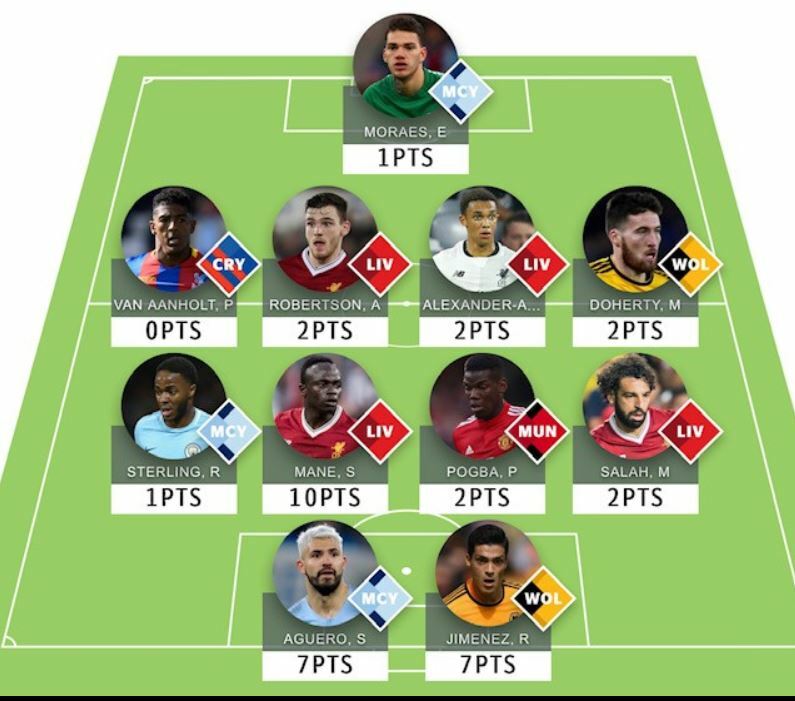 Good luck everyone for GW32! Plus the Geeks first draft free hit team article. 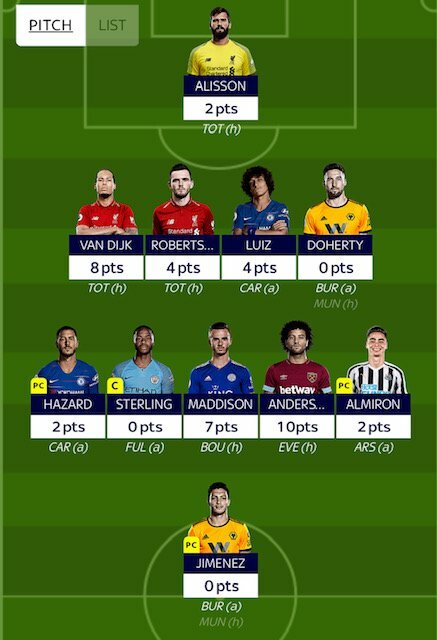 We have 9 of the same FH players in FPL, Andrew. Only differences are you have Kepa and Bernardo wheareas I have Ederson and Deulofeu. I am not sure about a double up on the Chelsea defence, and feel to go without a City defensive asset could be a mistake as I can easily see 2 clean sheets for them against Fulham and Cardiff. Chelsea are struggling defensively. Bernardo is not that prolific a returner either so I am confident Ederson and Deulofeu can outscore Kepa and Bernardo. Best of luck with whatever you go with. Considering Watford have Utd and fulham 2 days later, i think its very likely that Deulofeu will play vs utd and be rested against fulham for the fa semis. I think David Silva might be a great choice given he has no international commitments. All speculation about who will or won’t be rested and in what games. I think you just pick your team and take your chances, regarding rotation. Kepa and Young could become De Gea and Luiz for an additional 0.5£. That would put more Chelsea attacking (even if it is a defenseman) resources into your team, CHE have easier fixtures than MUN. This week the template is to put more resources (£) into MCI, CHE and MUN in that order, all other things being equal, like form. Fortunately, Sterling and Aguero make that call easy. But it also shows in my current draft of B or D Silva instead of La Porte; attacking points are more valuable vs weaker competition. I’ll illustrate with clean sheet odds, but there is much more evidence as you know. MUN attacks WAT (Clean Sheet odds for BRI are 7.50) and WOL (CS 3.75). CHE attacks CAR (CS 6.50) and BRI (CS 9.50). Thus, use a defenseman like Luiz for CHE, with the possibility of more attacking points than Young due to the easier fixtures, combined with MUN’s De Gea. MUN also faces stronger attacking teams, primarily because of facing the WOL attack (even with some rotation), than what CHE faces from BRI (the odds have WAT and CAR surprisingly close). Since we are indifferent to which combination of players gets the clean sheet points, the difference is in saves. De Gea faces stronger competition (and has more saves than Kepa this year, not to mention that last year his saves and some poor MUN defense are what propelled him to a great fpl season) and thus De Gea might get more saves, validating his pick over Kepa. Both Luiz and Young are relatively nailed, but all this goes out the window if you can predict game time. You can overthink these things. I’ve a gut feeling that Man U will come back strong from two loses. It’s that time of the season when teams start to focus on what’s ahead (FA Cup, Europa Cup, 4th place), while others have little to play for. Chelsea, who are unconvincing, play two teams fighting for their life. Man U play two teams thinking about Wembley. Take your pick. and have 1.3 mill left anyone any advice on any upgrades? Danny… that team is pretty much as good as it gets. Only player to possibly upgrade is Mili but there is not much else at the price range. Allan… Chelsea also play a team who are in an FA Cup semi, and Brighton are fairly safe from relegation, so it’s not very accurate to state they are fighting for their lives. I still agree with your overall point tho. I have 2.2m in the bank at present.. I just dont know what to do with it. Fairly happy with the team. Care to post your team? Ian, you’re right, I forgot Brighton we’re in a semi! My underlying feeling is, though, don’t trust Chelsea (I’m still putting Hazard in my team though and maybe one defender). Some of these teams are worryingly good, you guys must have plenty cash. Allan, thanks for the comment. My thoughts were pretty simple – play attackers against the weaker teams and the goalie that faces stronger teams might get more saves. The rest was just background. Besides that, if gut feel works for you, great, hopefully that means your brain is actually processing lots if information to produce a gut feel. My gut feel is ok but my style is numerical. I could do some tinkering and bring in Higuain for Batshuayi or Delofeu for Alli if I downgrade Azpil and Young to Luiz and Lindelof. But I am settled on all the other players. Really feel like taking a punt on Batshuayi however, because he is in good form for club and country. Could be good differential, hopefully. Therefore, the only change I may make is Delofeu. I’d like to go for Batshuayi, but he played x2 90 mins for Belgium. Also, Jiminez ownership is high. If I don’t go for him, I’ll go for Milivojevic. Jota worth a look, anyone? Yes he did Allan… but he looked very sharp in those 2 Belgium games. He doesnt look like he needs a rest, especially with just a handful of games left in the PL season. I am fairly confident he will start both games as long as he is fit. Want to ask what you guys would do…what would be the best plan of action? 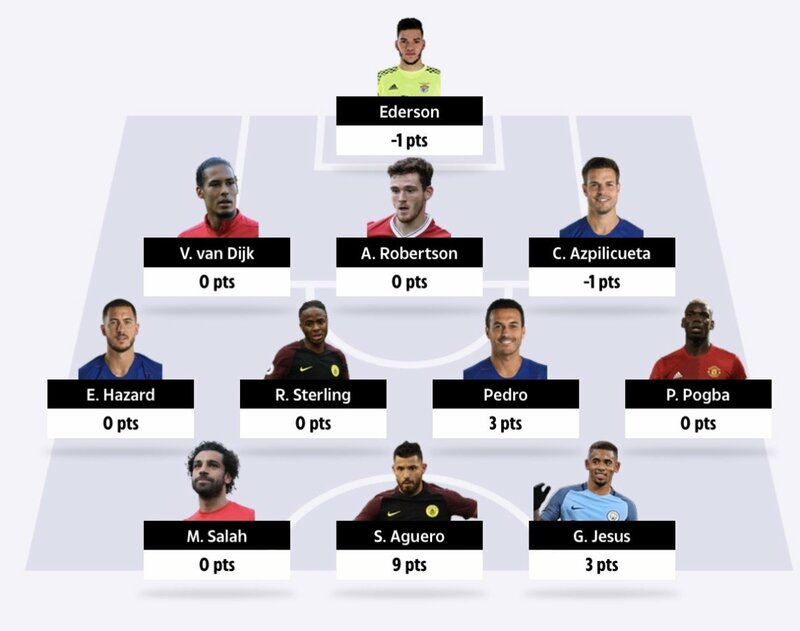 Should i stick to my wild card for GW35 or use it now? Or should i just -8 points to get Sterling/ Aguero/ Hazard in this week?